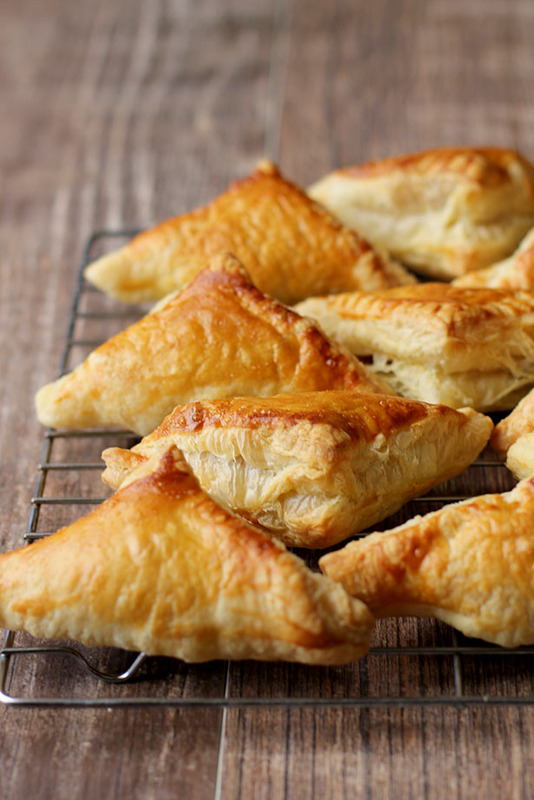 Today I’m sharing a recipe for flaky, baked homemade samosas that don’t really taste that much like real fried samosas and are a lot of work but are also super delicious. How’s that for selling a recipe? 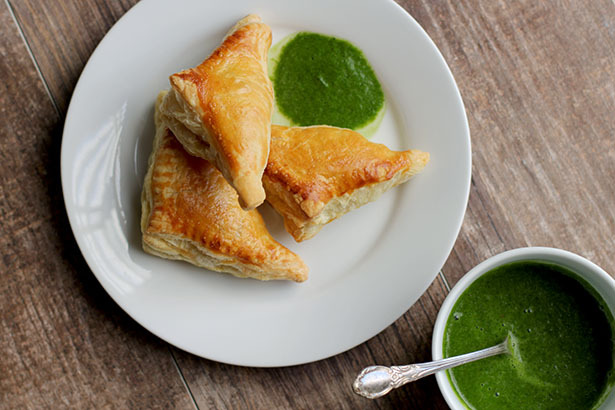 My friend Traci wanted to make homemade samosas and found two recipes for baked samosas, one from The Kitchn that uses egg roll wrappers and another on Food 52 that uses puff pastry. We got together one Friday morning and tried making the puff pastry version. It took hours. I don’t know, maybe our chatting made us slow, but I don’t think so. In the end it’s a recipe with several steps, one of which involves rolling out each samosa individually and stuffing them. It can get time consuming, especially if you are making a lot of samosas. Traci and I did have a lot of fun cooking the samosas, but it was indeed a labor of love. The good news is the samosas were really delicious. The texture was nothing at all like a fried samosa you would get at an Indian restaurant, but I suppose in the end that shouldn’t have come as a surprise. I mean, it’s puff pastry. And they weren’t fried. So, yeah, they’re gonna be different. But they are still really good and the filling is divine. Knowing that puff pastry samosas are best served fresh, Traci and I froze a bunch of the unbaked samosas for cooking later. When I baked a frozen batch they came out perfectly. So, if you do in fact decide to tackle this recipe, triple or quadruple it and then freeze a whole bunch of the samosas before baking. Although, if you just make one batch, then it won’t be as time consuming because you want be rolling out and stuffing as many. I’ll let you decide your own strategy! But the freezing-ahead aspect of this recipe is why I’m really excited about sharing it with you. Seriously, having homemade, yummy samosas just waiting in the freezer for you on a busy weeknight is pretty awesome. One more thing, the green cilantro sauce you see in the pictures. I threw that sauce together on the fly and it was almost good…but I added too much onion. As I was getting this post ready, I decided not to share what I did with you and looked up some actual Indian cilantro sauce recipes. This one on Fine Cooking looks like what I was trying to accomplish, so that’s what I will make next time. From Food 52, although I have rewritten the directions based on our experience with the recipe. Bring a large pot of salted water to a boil. Add potatoes and carrots and cook for 10 minutes, until tender. Drain water and mash potatoes and carrots together with a potato masher. Leave mixture slightly chunky. While potatoes and carrots are cooking, heat the olive oil in a pan over medium heat. Add onion, ginger, and cumin. Cook for about 5 minutes, until onions are tender and translucent. Add onion mixture, peas, cilantro, mint, garam masala, serrano pepper and salt to the potato/carrot mixture. Mix well. As I mentioned in the ingredients list, add salt ¼ teaspoon at a time and taste the mixture to get the right amount. Preheat oven to 375° F. Line a baking sheet with parchment paper. On a lightly floured surface, unfold one of the sheets of cold puff pastry and cut it into 3x3-inch squares. Roll each square out with a rolling pin quite thin (this is where my directions diverge from the original recipe more significantly). Place a scoop of the mixture onto the center of the square, about 2 tablespoons. You do not want to overfill or the filling will escape when baking, so it might not seem like enough filling, but it is. Brush two sides of the square with water just along the edge. Fold the dough over the filling diagonally to form a triangle, folding the unbrushed edges onto the wet edges. Once the dough is folded over, gently squish the filling sideways to fill the samosa evenly. Using a fork, press down all along the two joined edges to seal both sides, then flip the samosa over and crimp the edges with a fork again. 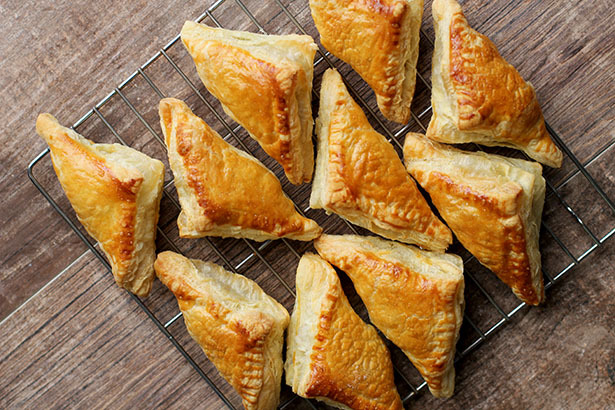 Place triangles on prepared baking sheet, leaving a bit of space between the samosas. Brush the tops with egg wash. At this point you can bake the samosas or place them in the freezer. 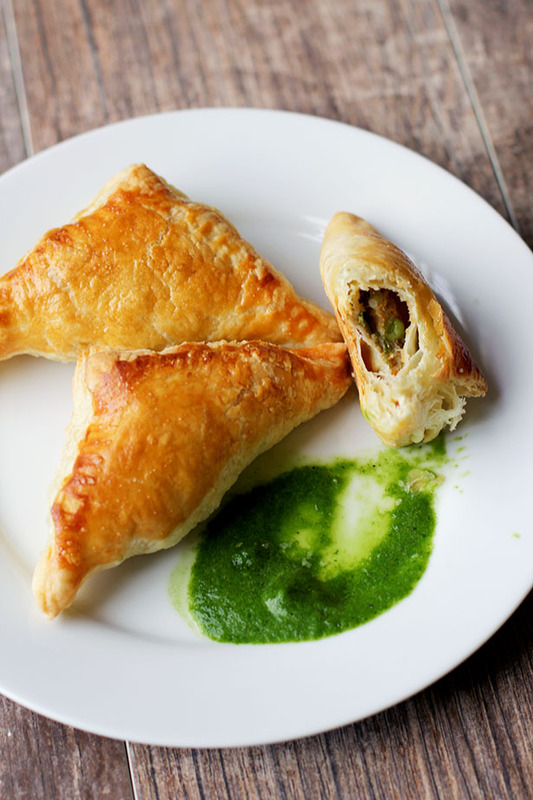 If freezing: Place baking sheet with samosas in the freezer. If freezing you can fit more samosas on the tray than if you were baking them. Fully freeze, then transfer samosas to an airtight container or ziptop freezer bag. When ready to eat, follow baking directions below, adding 5-10 minutes to the cooking time. If baking: Bake 30 to 40 minutes, until golden brown. Cool for a few minutes on the baking sheet, then transfer to a cooling rack. I think these were amazing,and I grew up on the true deep fried Indian style Samosas. The puff pastry adds a new element to the taste but the fact that it was not deep fried makes it even more enjoyably guilt free. I’m looking forward to another date in the kitchen with my incredibly talented friend Jane. yay! I am so glad you liked them!! If you freeze the samosas, do you thaw them before baking or bake from frozen?